Eid Messages – Best Eid Mubarak messages to send on mobile and to wish family and friends. Share these Eid Mubarak messages and Happy Eid Message in Hindi, English and Urdu. 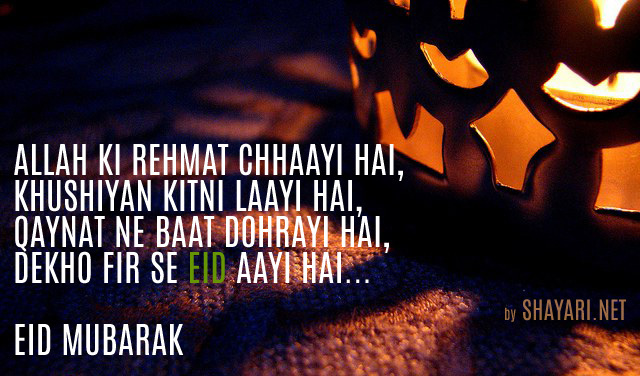 Kuch Musarrat Mazeed Ho Jaye Is Bahane Se Eid Ho Jaye Eid Milne Jo Aap Aajayein Meri Be Eid Eid Ho Jaye. Wish you a very Happy Eid. Eid is the combination of 3 meaningful words: E – Embrace with open heart, I – Inspire with impressive attitude, D- Distribute pleasure to all Eid Mubarak! Eid is an event which provides us an opportunity to sit together, to share our happiness and sorrows, May this great gathering, be always a part of our lives. Happy Eid day and Eid Mubarak. Hope love and laughter, warmth, wishes, joy & a bouquet of Eid wishes, jubilation become a part of your Eid and your life. May God bless you with the abundance of new friends, and all other blessings? Eid Mubarak! Chupke Se Chand Ke Roshni Choo Jaye Apko Dheeray Se Ya Hawa Huch Keh Jaye Apko Dil Se Jo Chahte Ho Maang Lo Khuda Sy Hum Dua Kaety Hain Mil Jay Wo Apkooo Happy Eid Mubarak!!! Wishing you all a very happy Eid, and hoping that all the things you wish for will be yours throughout the year. E-Embrace with open hearts I – Inculcate good deeds D -Distribute and share Allah’s bounties with the underprivileged Eid Mubarak! Wishing you smiles and all things nice. May this Eid bring all the comforts you have ever wanted, and all the joy and laughter you have ever wished. Happy Eid Mubarak. My wish for you on this Eid! May peace and joy embrace your life… And stay on this blessed day and always! Ameen…! I wish you a life full of smiles and happiness. Happy Eid Mubarak!! Eid Status – Eid Mubarak Status and Wishes for Whatsapp, Facebook and Twitter in Hindi, Urdu and English languages. This is the time to show the world that how much you love and happy on this occasion of Eid al-Fitr and Eid al-Adha by adding Eid Whatsapp Status. We, entire year keep changing our status on Whatsapp, Facebook, Twitter and rest of all other social media networks and now this is right time to keep updated your loved ones with the beautiful and divine Whatsapp status on Eid. Eid is a precious gift from God after Ramadan. My Eid day will be incomplete if I would not wish you with my best wishes. May the choicest blessings of allah fill your life with peace, joy and prosperity. Wishing you happy Eid soft as silk, white as milk, sweet as honey, full of money and cute as you. May this day bring peace and smoothness in your life, may it provide you the best time of your life. We wish that the Eid day will be the happiest day of your life and fulfill your life with happiness and joy. Wish we could share this great occasion “Warm memories have a lovely way of bringing folks together.” Although Eid finds us spending time apart, you’re very close in memory and always close in heart. May Allah bless you and your dear ones with peace, prosperity and happiness on the auspicious occasion of Eid. 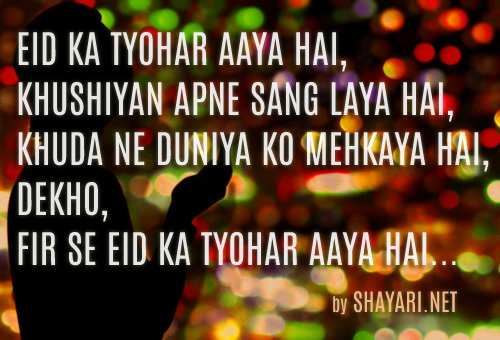 Eid Mubarak Shayari, Eid Wishes, Eid SMS, Eid messages, Eid Status for Whatsapp and Facebook in Hindi, Urdu and English languages.